The doctors in the Guatemala have removed the world’s largest uterine tumour from a 40-year-old woman’s body weighing 70lbs (32kg). 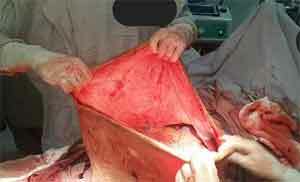 It is reported that it is the world’s largest uterine tumour reported till the date. The woman was suffering from uterine tumour from the last seven years. 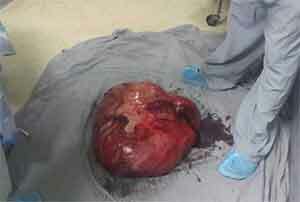 Due to the large uterine tumour the woman looked heavily pregnant. The doctors informed the media that the patient came to the hospital with the huge abdominal mass – which made her look pregnant with multiple babies – and gave her stomach a staggering circumference of 137cm. Medical Dialogues team had earlier reported the doctors of the Mexico General Hospital had removed a whooping 33 kg (157cm) ovarian tumour from a woman, which they had claimed itto be the world’s largest ovarian tumour to be removed as a whole.The growth weighed the same as ten new born babies – or roughly equal to the weight of a ten year old child. 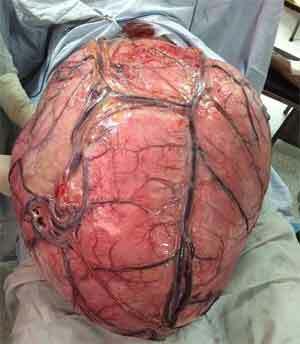 The cyst had become so large it was crushing the patients lungs and intestines, putting her at risk of heart failure.